Andrew Murray (1828-1917) was the son of a Scottish minister and a Dutch Reformed pastor. Murray was born in S. Africa and educated in Scotland. He returned to S. Africa and became a noted writer and pastor in Cape Town and Wellington. Murray was vitally connected to the Keswick meetings that espoused the Higher Life and Inner Life philosophies. This book is a good example of those teachings. 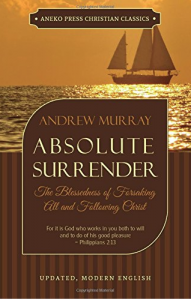 Murray’s way of obtaining spirituality is to let go completly of self and let God have full control of the believer’s walk. Though this sounds good in some respects, the book never tells exactly how that works since the believer always has to do something and cannot be totally passive. Still, there is some redeeming value in the book especially in areas of encouragement, devotion, and love of God.